Ingredients: cocoa mass, sugar, cocoa butter, emulsifier: soy lecithin, natural vanilla. Added ingredients: fruit (concentrated apple puree, concentrated orange juice), fructose glucose syrup, humectant: glycerol, wheat fibre, sugar, vegetable fat, rice starch, gelling agent: pectin, acidity regulator: citric acid, natural orange flavouring, anti oxidant: asorbic acid, colouring: curcumin E100. (cocoa solids 55% min). Allergy information: Contains soy. May also contain traces of nuts as these products are handled in our factory. Vegan friendly & gluten free. The classic combination of orange and chocolates never fails. 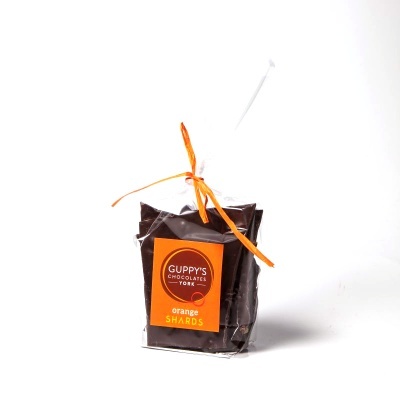 We simply add small pieces of tangy orange to the chocolate, which are bursting with real citrus flavour. Fantastic with the smoothness of the chocolate.